1/32 / 1/24 ELDON OFFY Indy Car. 12 Volt motor - Aluminum Wheels. Item sold as is due to age and availability. Make no assumptions as to condition, functionality, fitness for purpose or value. These are a bit large for 1/32 closer to 1/25 maybe?. Condition is Used. All of our antiques or collectibles will, hopefully, be exactly what you were looking for. Every item is hand picked and selected by our staff. See pictures for more details. This car is being sold "as is" and the sale is final. Pactra 1/24 Bugatti T35 Rustic, But cool. Front is bend but can be straightened or cut off. 1/24 SCALE CHASSIS # 2414 UNIQUE ENGINEERING. THE "LE MANS" LINE " LITE-NING" LIGHTWEIGHT CHASSIS, ASSEMBLED WITH AXLE, PICKUP,WHEELS AND TIRES. FITS 15 POPULAR MOTORS. DRAGSTER CHASSIS PART # 2412. Hard Body RTR Chassis. Silicone tires. 1/24 Slot Car. 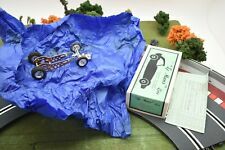 Midori 1/24 Scale Honda RA271 F1 Slot Car vintage 1965 RARE!!! You are looking at a Midori Honda RA271 F1 race car. This slot is built from kit and is 1/24 scale. Bench tested and running great. She is missing windshield and steering wheel. Great looking car, never run, display only. Check the first 5 pic's. adress and not to a overseas adress. the next group is all used stuff. Always kept in case. Can be run on both digital and analog. New ListingKOFORD OPEN ARM FOR C-CAN SETUPS(TOP GUN DRAG ARM)84.5 TG,.510 DIA,BAD BOY,NEW ! HERE WE HAVE A KOFORD (OPEN) ARM FOR C-CAN SETUPS(TOP GUN DRAG ARM)84.5 TG,.510 DIA,18 TURNS OF 24.5 GUAGE WIRE,ONE OF THE FASTEST AND MOST POWERFUL DRAG ARMS KOFORD MAKES !!!!! I BOUGHT THIS ARM TO TURN LAPS BUT WAS TOLD BY A GUY WHO ONLY RUNS DRAG CARS THAT IF I RAN THREE LAPS WITH THIS ARM I WOULD BURN IT UP,ITS DESIGNED TO RUN SHORT DRAG RUNS AND NOTHING ELSE(I DONT DO DRAG RACING),THIS IS A BAD MOTHER !!! I PUT THIS ARM IN A C-CAN WITH KOFORD NEO MAGNETS AND TESTED IT TO SEE IF IT WORKED BUT IT WAS NEVER MOUNTED IN A CAR OR RACED,THAT IS WHY IT IS OUT OF THE ORIGINAL PACKAGING,THIS ARM IS BRAND NEW AND I PAID 75.00 PLUS SHIPPING FOR IT !!!!!! SO ALL YOU DRAG RACERS IM SURE YOU KNOW WHAT THIS IS AND ITS A GREAT DEAL !!!!!!!!!!!!!!!!!!!!!!!!!!!!!!! The hard work and fine-tuning paid off that year when the Chip Ganassi Racing Team won the long distance race in the Ford in their class. The paintwork also exudes all-round sovereignty. The Ford's elegant black stealth look attracts stares everywhere it goes! 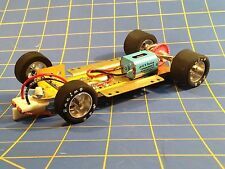 PARMA Zonda flexi-5 for GTP class complete roller NO MOTOR 4" car for 1/24 slot car racing. Here is a fun to run car,SOLD AS IS SEE PICTURES. Windshield has scuff marks,PLAYED WITH CONDITION. 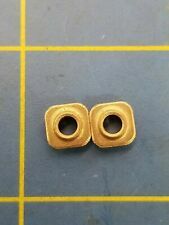 May possibly be used on AMT,Strombecker, Revell, Monogram, Atlas, Cox,, K&B, Eldon, Russkit, Tamiya, Hasegawa, Dynamic, Classic, Garvic, BZ, Varney, VIP, Scalextric slot cars. Great Brass Workings and Gears are beautifully Engineered, Designed and Assembled! Great Functional Conversation Piece! Mint Boxed, Unused after 50 years! Original Box & Wrapping Are Included. Made In Japan. Appears new. I’m calling it used because there is no original packaging. 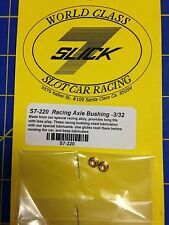 Check out my other auctions for more slot car parts. Coms 201-201.5 These arms are like new. Here up for sale is a used Cox brand 1/24 scale Chaparral 2C slot car body molded in white. Wheel wells are not modified. Windshield looks good with no glue marks showing. Body shows some stress cracks on the sides and the front area has scratches. The back right top air stack shows some chipping of the flare at the top end of the pipe. Looks like some glue marks are present on the drivers helmet top right side. Glue marks are also present on the inside of the body as shown. Nice looking body to either paint up or mount to your chassis as-is. Great for hardbody racing! Motor mount can also be offset to move motor to drivers side of chassis for oval and trioval racing. Accepts body pins well. Proven during hard racing in Imston Cup series. Alpha apron with pockets in full length to protect your clothes when serious slot racing occurs. Slot Drag Car 1/24 Black Plastic Body. Condition is Used. All of our antiques or collectibles will, hopefully, be exactly what you were looking for. Every item is hand picked and selected by our staff. 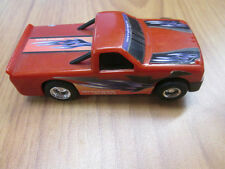 1/24 SLOT CAR DIFALCO COPYCAT CONTROLLER SUPERNICE GOOD PRICE! 1/24 VERY RARE Sky Queen by Shoji Nakatani metal slot car test track ... ready to go NOS in the original box....PLEASE NOTE: NOT SURE WHY THE TRACK HAS A "TARNISHED" APPEARANCE BUT IT DOES ??? ... straight from the 60's.. Made in Japan. 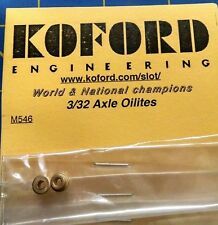 Can be used with AMT, Cox, Revell, Monogram, K&B, Russkit, Eldon, BZ, Rinalli, Strombecker, Tamiya, Hasegawa, Dynamic, Atlas, Classic, Garvic, Scalextric, VIP, Varney, Hawk, Pactra, etc slot cars. Winner pays shipping/tracking/handling costs...insurance optional at winners expense. Please contact me with questions. PLEASE NO EXPRESS CHECKOUT. I will contact winner. Paypal & MO OK. Check out my other listings. 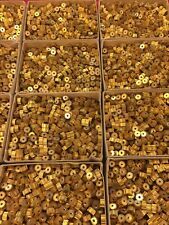 COX 1/24 SCALE #13032 MAGNESIUM FRONT WHEELS-5-40 THREAD-NOS-VINTAGE-NEW-RARE!!! 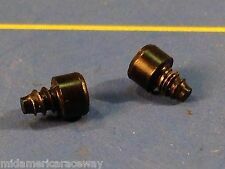 HERE ARE 6 NOS COX 1/24 SCALE PART # 13032 LOTUS 30 MAGNESIUM FRONT WHEELS FOR SLOT CARS.THEY HAVE A 5-40 THREAD. YOU WILL RECEIVE 1 CARD OF 6 PAIRS OF WHEELS. It turned out to be a successful farewell for the classic red-livery racer. The Ferrari Scuderia Filipinetti No.3, 1970 is equipped with headlights, rear and brake lights, and turns heads with its faithful reproduction of original details. It is still factory sealed in a plastic bag and in the original box. The cover and bottom of the box are in excellent condition. This is amazing condition for the age. As shown in picture 6, it is 1:25th scale. 1 New, Body Colors Will Vary, KOFORD M457A Group 12 Slot Car, Has, Spring Steel Chassis,Nat's Winning Gp 12 Feather Motor, 64 Pitch Gears, New in the Box,with instruction's. PARMA 1/25TH SCALE 1950 ford convertibl custom built with silicone rear wheels. Here is a fun to run car,SOLD AS IS SEE PICTURES. cuold use paint and windsheild. Very nice Hoffman style wooden pit box for 1/24 slot cars. The top holds two cars and accessories. The bottom will hold five more cars plus a smaller slotted area for parts. Has a hasp so it can be locked. I acquired this car second hand and used it briefly in a few club races. Part of a lot I bought. New Brazilian BC 747 chassis roller. 3/32 axel, 64 pitch spur gear. Makes great F class car. KOFORD OPEN ARM FOR C-CAN SETUPS(TOP GUN DRAG ARM)84.5 TG,.510 DIA,BAD BOY,NEW !